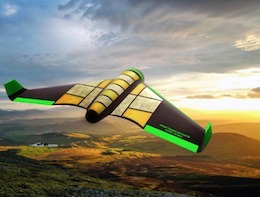 Today in drone news: Pouncer edible drone, Chipotle delivers, Footage of kayaker swimming with orca, Football practice, S.L.A.M Dunk Dev Kit, Dobby "selfie" drone, Dronesurfing. At the drones sub-reddit, user suddenmovez (as in "don't make any"?) asks, "Looking for a first drone... suggestions?" Sens420 says, "If you've never flown before, get yourself a Hubsan X4 107L." JimJardashian quickly responds, "This isn't the 1950's anymore. 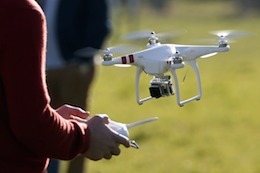 Women can fly drones without needing a Hubsan." Galaxy1004 offers, "I've tested all of them and I'd recommend the Syma X8C and the Hubsan X4 as one of the best starter drones out there." And member n8sobes1216 adds, "The Hobby is fun! If you want a smaller one to get started on, I'd recommend the Quadrone Procam, it's about $70. For around $200 you can get a pretty decent drone that records in 1080p. But if you've got the cash I'll always recommend the DJI phantom 3 line!" And, just for fun, member officialwitchraid shares a video of a drone dropping a bouncy ball from 200 feet. ChrisM0678 says, tersely, "This idiot it going to be fined by the FAA." JustSmeRandomA--hole adds, "What is the point of this... So dumb..." And yspud, getting into the spirit of the venture, writes, "Mind. Blown. Wow! Nice job guys. Keep it up. Maybe start a "dropping stuff from drones" channel." Readers: Does this strike you as a harmless bit of fun, or potentially dangerous? Would you watch a ‘dropping stuff from drones’ channel? Hit REPLY and let us know whether you think this is just harmless fun or something more troubling. We’ll end each newsletter with a random mystery link to something fun and drone-related! Happy clicking!